PVM introduces distributed computing, discusses where and how to get the PVM software, provides an overview of PVM and a tutorial on setting up and running existing programs, and introduces basic programming techniques including putting PVM in existing code. There are program examples and details on how PVM works on UNIX and multiprocessor systems, along with advanced topics (portability, debugging, improving performance) and troubleshooting. 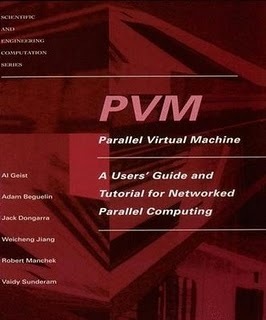 PVM (Parallel Virtual Machine) is a software package that enables the computer user to define a networked heterogeneous collection of serial, parallel, and vector computers to function as one large computer. It can be used as stand-alone software or as a foundation for other heterogeneous network software. PVM may be configured to contain various machine architectures, including sequential processors, vector processors, and multicomputers, and it can be ported to new computer architectures that may emerge. George A. Geist II is Research Scientist at Oak Ridge National Laboratory. Adam Beguelin is Research Computer Scientist in the School of Computer Science at Carnegie Mellon University. Jack Dongarra is Distinguished Scientist, Weicheng Jiang is Research Associate, and Robert Manchek is Senior Research Associate in the Department of Computer Science at the University of Tennessee. Vaidyalingam S. Sunderam is Associate Professor in the Department of Mathematics and Computer Science at Emory University.